Tuesday June 30th 1891 I had Agnes go home last night as she is not well. We got the ironing done and I set out a lot of cabbage plants. Mother and I went down where they were working the road this forenoon. Will took me to town after dinner. I was not gone long. The folks were all over in the evening and we were out looking at the road. weather quite cool. Wednesday July 1st 1891 It was a pleasant day and Fanny & Annabell came over to spend the day. Ott was here for dinner. We had such a nice day. Lee come home and after supper Will hitched to the Surry and we took a pleasant ride. I was sewing on Wills shirts what spare time I had. Thursday July 2nd 1891 Agnes came back this morning and Mother went to town to spend the day. I done some sewing. I was out to the pasture with Will in the forenoon. Lee brought Mother home before supper. The boys all went to town in the evening. Father, Mother, and I sat on the porch all evening. 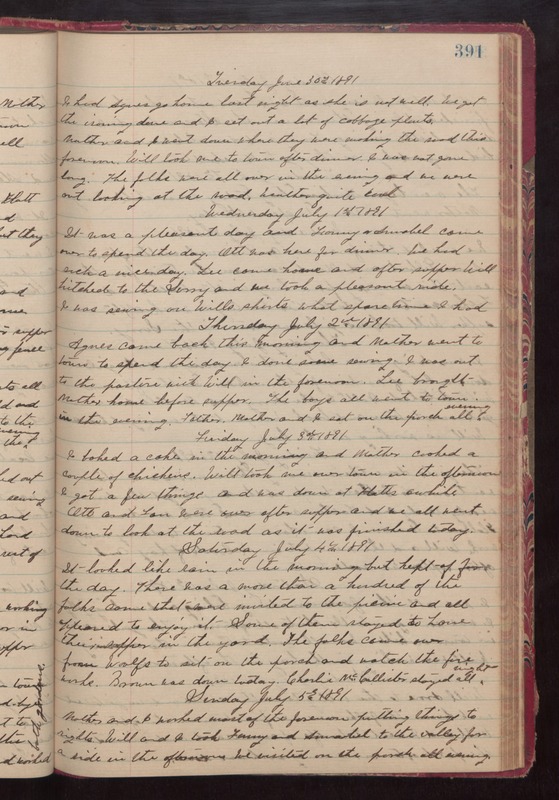 Friday July 3rd 1891 I baked a cake in the morning and Mother cooked a couple of chickens. Will took me over town in the afternoon. I got a few things and was down at Hatts awhile. Ott & Fan were over after supper and we all went down to look at the road as it was finished today. Saturday July 4th 1891 It looked like rain in the morning but kept of for the day. There was a more than a hundred of the folks come that were invited to the picnic and all appeared to enjoy it. Some of them stayed to have their supper in the yard. The folks came over from Woolfs to sit on the porch and watch the fire works. Brown was down today. Charlie McCalister stayed all night. Sunday July 5th 1891 Mother and I worked most of the forenoon putting things to rights. Will and I took Fanny and Annabelle to the valley for a ride in the afterbnoon. We visited on the porch all evening.